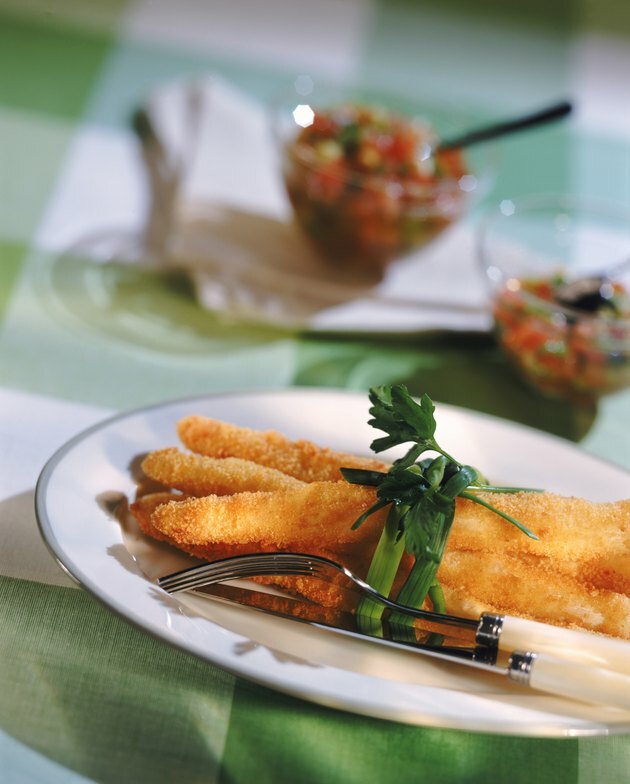 Common gatherings on Friday nights during Lent, fish fry dinners are exactly what they sound like -- meals that feature fried fish and a variety of side dishes. Though fried fish does supply certain nutrients, it's also high in fat. The occasional fish fry meal, however, can have a place in your healthy eating plan as long as you practice moderation and know what to have on the side. French fries are among the most common additions to a piece of fried fish, but they're usually too high in saturated fat and sodium to be considered a nutritious side dish. A fry or two, just for the taste, won't ruin your meal, but don't make them a star. If sweet potato fries are an option, they're better than regular fries because they supply a good dose of fiber and vitamin A. Potato salad is commonly served at fish fry dinners, but the mayonnaise usually included in the recipe is high in saturated fat, which isn't good for your heart. A one-third cup of potato salad contains 108 calories and 5.7 grams of fat, of which almost 1 gram is saturated. Cole slaw is a staple at many fish fry meals, and the cabbage in the dish is a good source of fiber, but if it's made with mayonnaise, it also contains a large amount of saturated fat. Some fish fry meals are served up with mixed vegetables or green beans, and these are lower-fat options that also add fiber and potassium to the dinner. Corn-on-the-cob, another fish fry staple, is a healthy choice, too, as long as you don't drench it in butter and salt. A tablespoon of butter contains 102 calories and 11.5 grams of fat, of which 7.3 grams are saturated. A white roll is often added to a fish fry meal, and it's low in fat as long as you don't spread on a bunch of butter. If a whole-wheat roll is an option, go for it because it's higher in fiber than white rolls. Macaroni and cheese is often served alongside fried fish at a fish fry. While macaroni and cheese does supply protein and calcium, the butter and cheese also adds 310 calories and 869 milligrams of sodium to the side dish, so if you want mac and cheese, stick to a small serving. Consider skipping the hush puppies because they're made by deep-frying cornmeal. Deep-fried foods are usually high in saturated fat. Ketchup and vinegar are fat-free dipping sauces served at most fish fry events. Vinegar is also low in calories, but ketchup can also contain an unhealthy amount of sodium. Tartar sauce is almost always served alongside fried fish, but it contains 63 calories and 5 grams of fat per 2-tablespoon serving. Stick to a teaspoon or so, which is enough to get the flavor of the condiment, but also helps prevent you from eating too much saturated fat. If the fish fry you attend offers baked fish, consider that over the fried fish. Baked fish is low in saturated fat and supplies a good dose of protein. Skip the fish sticks, however, because these are usually deep-fried and higher in saturated fat than baked fish. Food Lovers' Guide to Pittsburgh; Sarah Sudar, et al.